During an Aug. 6 show featuring Ratt and Extreme at New Jersey's Starland Ballroom, nostalgia reigned supreme for rock hounds who were enjoying a massive dose of '80s glam rock. 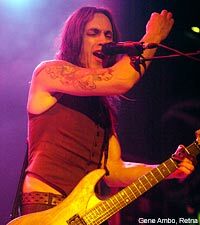 During their set, Extreme ace guitarist Nuno Bettencourt asked the crowd who plays 'Guitar Hero.' He also offered a ringing endorsement for actual guitars, saying that kids should pick up the real thing because "the next generation of rock 'n' roll is not dead!" The band also ripped through a rocktastic cover of Michael Jackson's 'You Wanna Be Startin' Something,' which closed out their set.